Paola and Jackson, could you both share your respective experiences as they relate to the power of grandmothers as effective community builders? Jackson: Growing up in rural Uganda in Africa, we all learned so much from grandmothers. We would sit at the fire and our grandmothers, called mukaakas in my village, would tell story after story. Some of the stories were like prophecies of what one would do with their lives; all were the means by which knowledge of days gone by was passed along. To this day, there are few books for children to read or household computers. Grandmothers ensure the continuity of passing along knowledge comes through them to their grandchildren. When you meet women in my village, none of them lack self-confidence, as much of their identity and confidence comes from this role. In my book, A School For My Village, I tell the story of my own grandmother walking many miles each evening to visit me in the hospital when I was nine years old and spent 6 months healing after falling out of a tree. She was so committed to helping me heal and teaching me love and compassion. Paola: I saw this in India as well while doing research for my book, Grandmother Power. I was told there was a particularly good storyteller in the village that I needed to meet. It was remarkable, as soon as she began to tell the story, all the children in the village of all ages, probably 100 or more gathered around to listen to her share. She was old and well into her nineties. The story was all about animals and ways to understand and be in the world, as well as relationships. The children were absolutely transfixed. There wasn’t a sound made amongst any of them. Grandmothers as keepers and distributors of knowledge have an important role worldwide and not one we see so much in the United States. Jackson: You allude to grandmothers preserving culture in your book. I must agree. Grandmothers are the heart and soul of the village. In many developing countries, respect for elders is first and foremost and that means when the elder person is talking to you – you listen! These stories are passed on from generation to generation, recognizing that with age comes wisdom. I see this less in North America where older folks are placed in nursing homes and they are there by themselves with other elderly people. It seems a shame to me, as the knowledge the elders have is something young children are missing out on. Instead of watching Youtube they could be listening and learning from their elders. Paola: I agree this might be true in some places, but in the United States more than half of all grandmothers are still working. For a number of reasons this “baby boomer” generation is too young to retire at 65. Also, many grandmothers in United States are becoming so at a younger age. So, while the stereotype is that grandmothers are very old, well into their seventies and eighties. There are about 42 million grandmothers in the United States and more than 50% of them are between the ages of 45 and 64. Most are still working and don’t have a lot of spare time, however, I found they are still very engaged in their grandchildren’s lives. Likewise, some 2 million grandchildren are being raised by grandmothers in the United States. Jackson: Grandmothers all over the world have so much to learn from one another. If a grandmother in my village knew that a 64 year old grandmother in the United States still wakes up to go to an 8-5 job, so many stereotypes would be shattered. Likewise, when I talk to grandmothers in the United States and explain to them that the grandmothers in my village are caring for 5 grandchildren in a 12×14 shack, they simply cannot comprehend it. Beyond building local community, if we connect these groups of women from each side of the earth, they would learn about resilience on each other’s side of the planet. It would produce common understanding and support beyond borders. This world is not good enough for their grandchildren; somehow they would do whatever they could for their grandchildren so they left this world a better place. Jackson: Isn’t that remarkable given how difficult their lives are from the moment they wake up? Doesn’t it show the important role grandmothers play in their communities despite their age and stereotypes? Paola: Your grandmothers that were featured on CNN when you were recently selected a 2012 CNN Hero, inspired me to write Grandmother Power. I was in Kenya interviewing women about a water project and each one came to me and answered the question, “How many children do you have?” in the same formulaic way – 4 children and 8 adopted; 5 children and 15 adopted and so forth. What they were really saying is that their own children had died of AIDS and they were raising adopted grandchildren as a result. I was stunned at the sheer loss of life for these amazing women. This went on and on and every woman had a similar experience and I forgot to be an objective journalist at that point. There was just so much sadness. Jackson: They were acting as the ultimate community builder by ensuring that despite losing their mother and father their grandchildren had a life filled with hope and possibility. That’s what we experience at The Nyaka AIDS Orphans Project in our Grandmother Program. We have nearly 7,000 grandmothers in 91 groups across two districts, and they are responsible for raising collectively 34,500 grandchildren who otherwise might be homeless. What I find very surprising is over and again, as we explain our holistic approach to people and tell them we are working with close to 7,000 grannies, and people are shocked. Despite the research showing the multiplier effect for women and their communities from small microfinance loans like the ones we offer our grannies, people act surprised that this is the area that we find is most effective in giving a hand up to these hard working women. These grandmothers prove every day that they have the capacity to make things happen despite their age or condition. They still have power to pass on knowledge and counsel children. When we made our new commitment this year at Clinton Global Initiative to increase and expand Nyaka’s Grandmother Program, it shocked so many people to learn how inexpensive it is to give a hand-up to grannies so they can send their grandchildren to school. Paola: I had a similar experience in India. Barefoot College trains, in addition to other things, women to become solar engineers. I met grannies in a village, where camel out number people and darkness was a way of life, who went to the Barefoot College and became solar engineers because young men and women would have run to the city with their new training. Instead these grandmothers installed solar panels on each hut back in their village. Soon after, everything changed. Children could study without getting black lung from kerosene, the light provided safety in the dark, midwifes could see to deliver babies, refrigeration allowed food to stay good for longer, and the women could engage in electronic banking thanks to their ability to charge their cell phones! Grandmothers are now responsible for 10,000 households in rural India have solar electricity. The United Nations paid attention and have started sending grandmothers to Barefoot College from around the world. Grandmothers, with no common language, have come and trained through color coding, gestures, and demonstrations from 24 countries and have electrified 35,000 homes in the Middle East, India, Asia, South America, and Africa. I found grandmothers in 33 countries who were engaged in activist work to make the world a better place for their grandchildren. The ways by which they were doing this was varied, but the reason was the same: to leave the world a better place for their grandchildren. Jackson: In other words, grandmothers are bread-winners, innovators, and children-raisers world-wide. They are a force to be reckoned with! 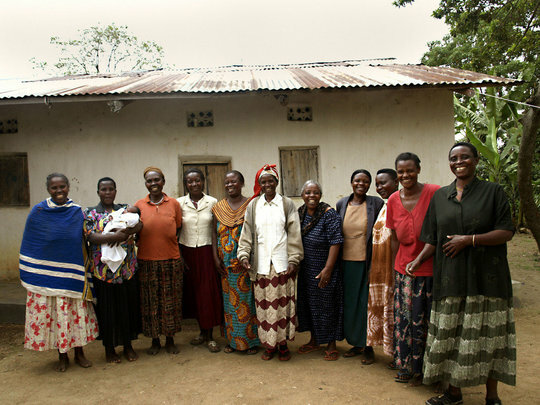 Where Nyaka works, the grandmothers have become a force of social change in what has been a very traditional patriarchal society. This has evolved mainly because of HIV/AIDS. Growing up as a child you knew your grandmother was there to help you stay out of trouble and keep an eye on you. That changed with the tide of HIV/AIDS sweeping across Africa. The grandmothers lost the children they had worked so hard to send to school as their retirement fund. It was expected that those children would attend school, work hard and become successful so they could help their parents in old age. HIV/AIDS wiped out their retirement fund and left them nothing plus grandchildren to raise with nothing. Regardless, the grandmothers took on the role of parent afresh, and as such are not just the backbone of society, but the foundation from which much hope and future arise in rural Africa. Women, who never thought themselves businesswomen, have become chairpersons of their grandmother groups, leading discussions on how to use microfunds which we provide. Paola: It was also surprising to me to learn that most grandmothers were working in relative isolation, and when they learned of others around the world, they were so buoyed by the news that they weren’t alone and immediately began networking. As far as I can tell, this hadn’t happened much before and I do hope that my book and the work of the Nyaka grandmothers will inspire more grandmothers worldwide to become more engaged and that it will build global community between these powerful women. They are doing something extraordinary for this world. Despite being grief stricken and sometimes old and infirm, they are committed to their grandchildren and that overrides seemingly very difficult circumstances. While stereotypes that grandmothers or the elderly are disposable still exist, these assumptions are not accurate and as the conversation bridges across all corners of the globe it is my hope that grandmothers will be revered for their work. Younger folks are surprised to learn of grandmothers like those who became solar engineers. They are surprised to learn grandmothers are effective at teaching and sustaining tradition, as well as causing social change. Jackson: Many of our grandmothers are surprised by their own power and strength. I am inspired by them to work hard every day. These grandmothers are a force to be reckoned with!